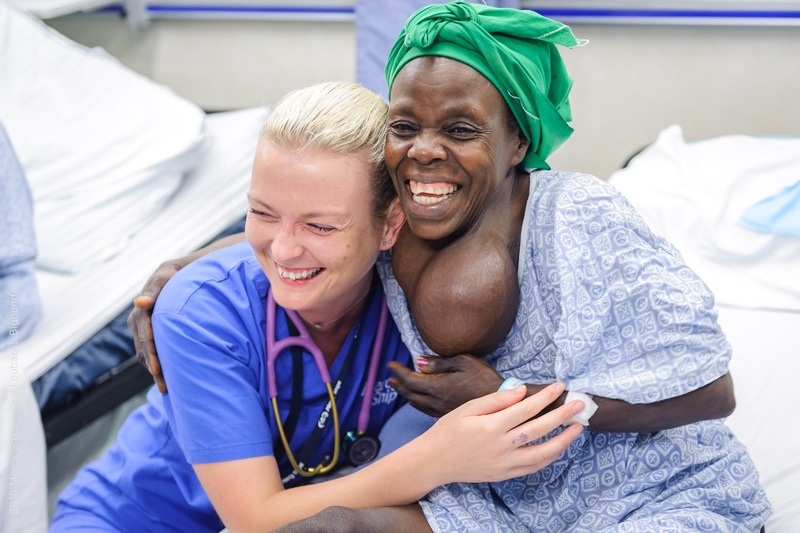 I am an RN serving with Mercy Ships, a floating hospital that delivers free, world-class surgical services to the forgotten poor in developing nations. As a volunteer I am not receiving any form of payment for my service with Mercy Ships; in fact, I am responsible for paying for all my individual expenses, including room and board. 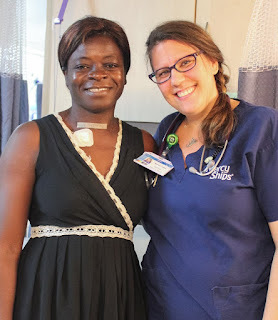 If you are interested in partnering with me through financial support please visit my donor page http://mercyshipsus.donorpages.com/crewmates/NicoleLukens/. Group picture with the first 3 Thyroidectomies of the year. Its been busy on A-ward this month! 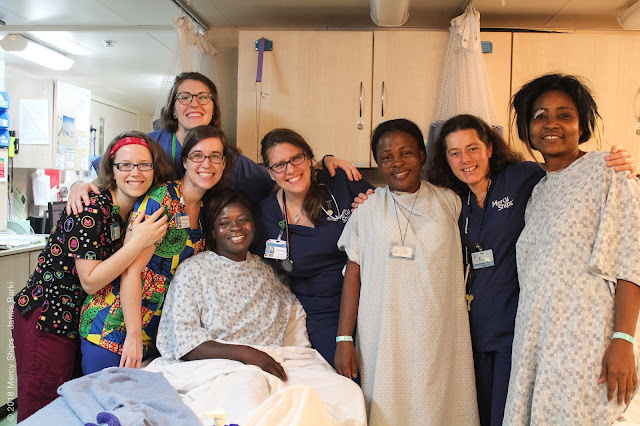 We are taking a break from obstetric fistula surgery. 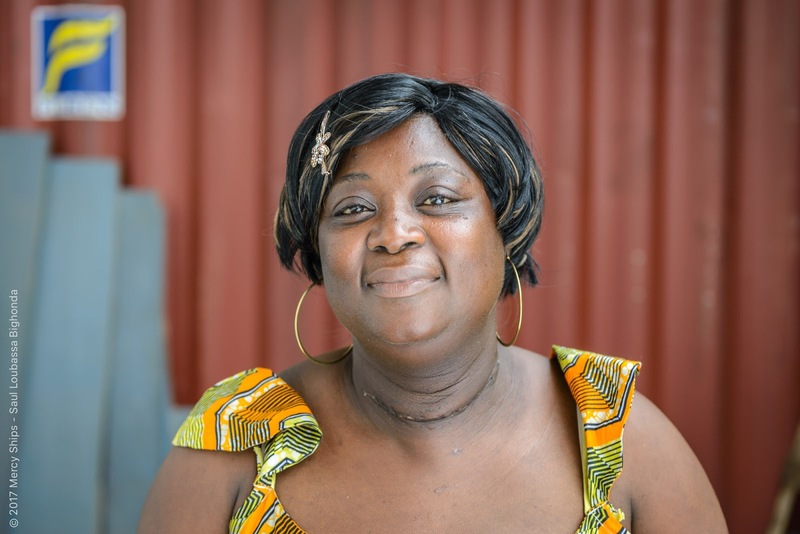 Our last fistula patients were discharge a little after the New Year. We will continue fistula surgeries in a couple months, but currently we are caring for general surgery. While I do miss the fistula ladies, I am happy to be back at the surgeries I started with here on the Africa Mercy. 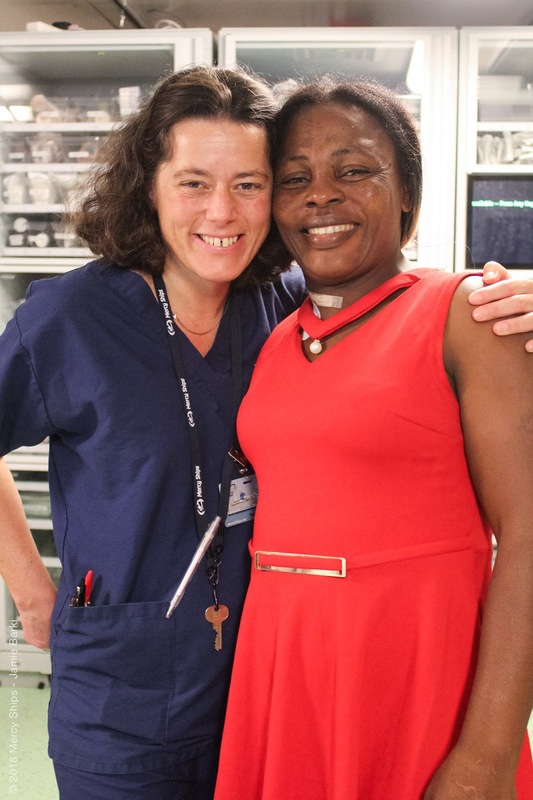 Over the last few weeks A-ward has had 2 general surgeons in separate ORs operating. This means we are doing 6 to 8 surgeries a day. Our general patients don’t stay long. Half discharge the day after surgery and the other half stay a couple more days. By the end of the work week we are filled to capacity and then empty out over the weekend, ready to start a new week. On top of the double general surgeries A-ward is also caring for 3 pediatric eye surgery patients every week. This was my favorite time on the ship last year so I’m excited to be a part of it again. Why do I love general surgery so much? Our general surgery patients don’t stay long. It’s harder to build relationships with them, but that doesn’t mean their time here on the Africa Mercy is any less impactful. The last few weeks have been such a blessing as I’ve helped care for so many people after a variety of surgeries. Sometimes I get busy and forget to see the beauty and blessings that surround me in the hospital, but then I’m reminded in the small ways, the impromptu day to day happenings, how much of a blessing it is to work on this ship and know my patients for the short time they are here. The following is one story of how a simple moment can mean so much if I just take the time to listen. excited when the anesthesiologist came to assess her. When the first thyroidectomy patient returned to the ward at the beginning of general I was on shift orienting a new nurse. Our thyroid patients come to us with similar stories. One day the gland in their neck starts to grow into a goiter and they are helpless to stop it. How we feel about our physical appearance is something women all over the world struggle with, but add to that a cultural superstition that a deformity is a curse, a punishment for wrong doing, or the sign of a witch not looking as everyone else can be even more socially isolating. Many of our women come to us hidden under their scarves so the world cannot see. 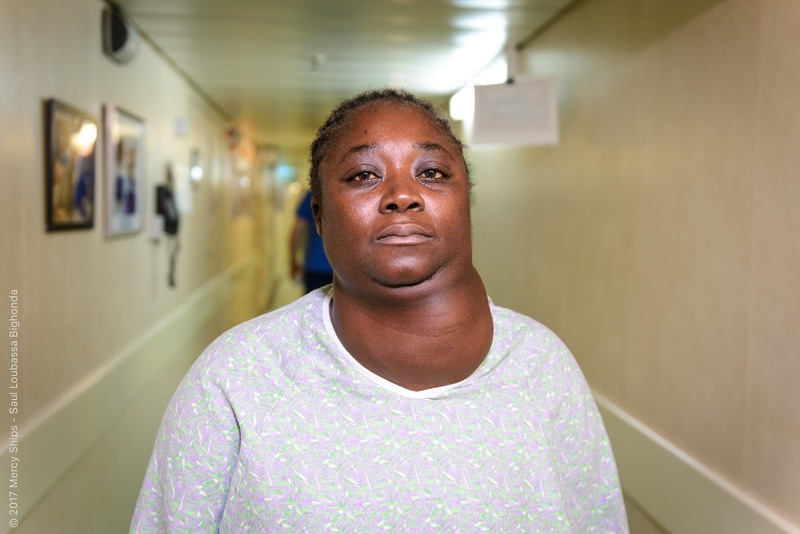 Left untreated these thyroids can continue to grow until they literally strangle a person to death, but removing the goiter does even more than saving her life. 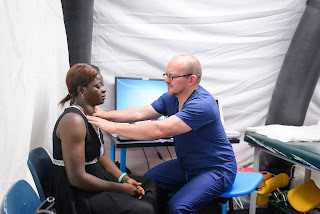 Removing a goiter hands a women her life back; it gives her hope that she can be accepted, free of this burden she has been carrying. This is why on days like this first day back to general surgery one of my favorite things to do is to hand our patients a mirror. Even when sleepy and uncomfortable everyone has the same reaction, and this first patient was no different. I handed over the mirror and as she looked at her flat neck for the first time, she smiled with surprise then breathed a sigh of relief as her whole body relaxed. She held onto the mirror even as we worked and life went on around her. That mirror showed her that yes, what she hoped for is tangible. this burden we carry. Left untreated and unforgiven this burden, this curse, will lead to our own eternal death; however, we too still have hope because of the gift we have through Jesus and his sacrifice for us. Because of this blood, God does not see our burden (our sin); the burden is gone, it’s cut away, and when we see our new refection the way God sees us now, we too will smile in surprise at what he has done and breath in relief of the hope we have for eternity. 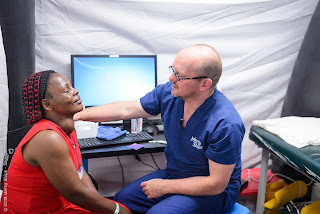 While I am currently serving with Mercy Ships the ideas and opinions expressed here are my own. Mercy Ships has not reviewed nor do they endorse the content written within this blog. 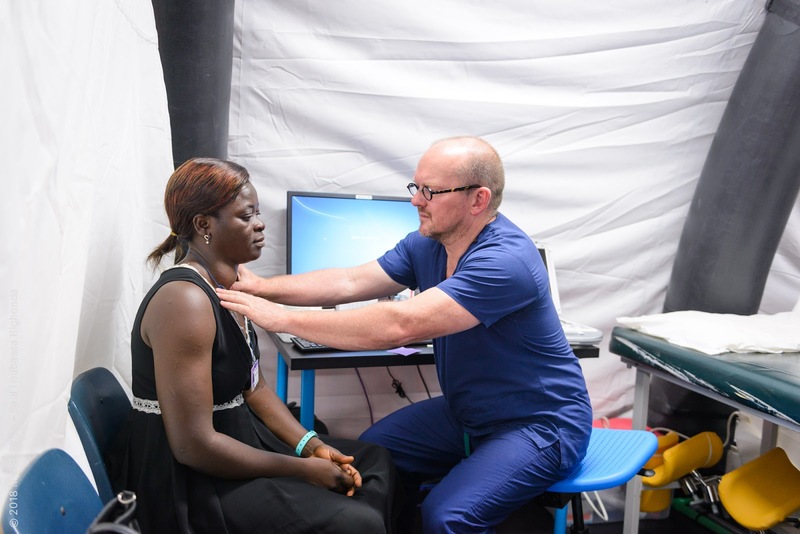 Photo Credit to Saul Loubassa Bighonda and Jamie Barki the Mercy Ships photographers who took the pictures I've shared in the blog post.